A tablet computer cover is a great project for a beginning quilter because the design is small and colorful, and you can finish the project in just one evening. Plus, you don’t need to worry about a lot of stuffing, and the cover serves a practical purpose in addition to being a work of art. Dive right into this fun project that has limitless possibilities for creativity. 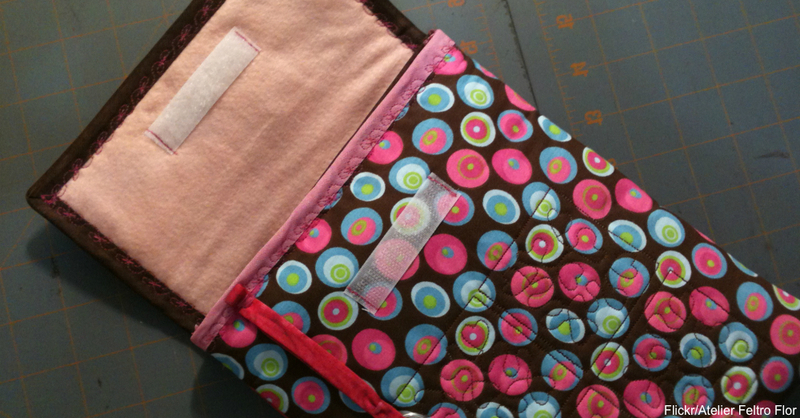 You can make this tablet cover with just about any type of fabric in any color. You can even grab scraps for this project. For color pattern ideas, find your favorite outfit and match the cover to the outfit as if you’re buying a purse or a pair of shoes. This cover is 14 inches wide and 23 inches long. You need two pieces of fabric, one for the outside and one for the inside. You might try contrasting colors so you know which half is the inside and which half is the outside. You can get one large piece of fabric or sew together scraps to make the size you need. Other supplies include a large button, elastic cording, batting and thread. Gather your tools, such as a cutting mat, a ruler with bias markings, a water-soluble marker, fray check and scissors. Measure your device’s length and multiply that by 3 1/2 to determine the length of fabric you need to cut. For the width, measure the width of your device, then the depth, and then add 2 1/2 inches to leave enough room for your device. Cut or create two pieces of fabric the exact same dimensions on the length and width. Cut your batting the same width as the two fabric pieces but 1/2 inch shorter for the length. Now you’re ready to start sewing this together. On your table, lay the top fabric, or the fabric that faces outward on your case, down first with the design right-side up. On top of that fabric, lay the bottom fabric with the design side down. Then lay the batting on top. Sew the three pieces together using a 1/2-inch seam, and leave the top of the case open. Cut the corners and remove any excess fabric from the edges. Flip this inside-out so the top fabric forms the front, while the other fabric forms the back, and the batting is in the middle. Fold the open end inward 1/2 inch on both sides. Press the opening and pin in place. Cut 7 inches of elastic cord and find the center of your flap and mark it on the inside of your case. Fold the cord in half with the two ends on either side of the marked middle, and pin the cord in place. Sew the flap shut so the cord stays secure. Double-stitch over the elastic cord to ensure it remains secure and sturdy. Mark the quilting lines on the inside portion of the cover. Stitch the lines in the quilted pattern. Fold over the case to give your device ample room to slide around while providing cushioning at the same time. Sew 1/2-inch seams along both sides to join the pocket together. Sew a button into the middle of the lower flap so the elastic cord seals the carrying case shut. Take your tablet covers to a new level with these designs that incorporate felt, an open area so you can use your tablet while in the cover, and knit designs using yarn. This tablet cover incorporates an extra zipper pouch for earbuds or a charger. As you become more proficient, these tablet covers make great gifts for your tech-savvy loved ones.This easy tablet cover design gets you started on the right track to creating more complex designs later. Watch how to make this neoprene tablet cover for something durable and good-looking.